Lord, I know he’s not my own, not of my flesh, not of my bone. Still Father, let this baby be the son of my love. Father show me where I fit into this plan of yours. I thought of Mary the mother of Jesus, barely into her teenage years when the angel announced God’s plan for her; I thought of the 12 disciples, just ordinary men totally clueless of God’s plan for them; or Nicodemus, one of the religious leaders who finally saw Jesus for who he was, and the many others who were there as the Glory of God revealed through his Son, unfolded right before their eyes—knowing something important was going on but not being totally sure what it all meant. I smiled as I thought about my own life and how much I understood their curiosity. The story of the life of Jesus from birth to resurrection is said to be the greatest story ever told. This morning we’ll remember the story of the resurrection of Jesus Christ from the dead. This is a story that does not allow us to remain neutral, like most stories within history, because if it is indeed true (and I am persuaded that it is), it demands a response. Now there was a man named Joseph, a member of the Council, a good and upright man, 51 who had not consented to their decision and action. He came from the Judean town of Arimathea, and he himself was waiting for the kingdom of God. Going to Pilate, he asked for Jesus’ body. Then he took it down, wrapped it in linen cloth and placed it in a tomb cut in the rock, one in which no one had yet been laid. It was Preparation Day, and the Sabbath was about to begin. The women who had come with Jesus from Galilee followed Joseph and saw the tomb and how his body was laid in it. Then they went home and prepared spices and perfumes. But they rested on the Sabbath in obedience to the commandment. I'd expect that when it says they rested, that it meant that they did no work in keeping with the Sabbath regulations, but I can’t imagine that they were able to actually feel at rest. Their lives had been turned upside down and inside out. I can only imagine their struggle, but the closest I can come is to say there was likely absence of joy. Sorrow, guilt and hopelessness were their constant companion or as the Psalmist writes in Psalm 88:18, “and darkness has become my only friend”. I have had moments in my life that felt that dark—haven’t you? I’ll bet they could hardly wait to go to the tomb to finish preparing Jesus’ body both out of love for him, as well as the need to be busy, to do something, and probably to get away from the gloom and feelings of guilt of the disciples. First thing on Sunday morning, the women come to the tomb with their spices, fully expecting to find Jesus' remains. It needs to be understood that these women did not go to Jesus’ tomb believing in the resurrection. They did not go to check and see if the tomb was empty. The fact that they took spices along to anoint the body shows what they expected to find, despite the fact that Luke records Jesus speaking of his death and resurrection six times before the actual event. So, the first people who had to be convinced of the resurrection were the disciples themselves. 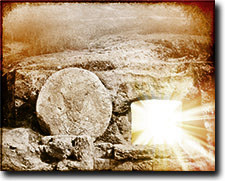 In a real sense, they were the first skeptics to become convinced that Jesus was raised! Imagine if you will what must have been going through their minds. Remember that they are grieving and essentially numb, unable to think clearly, then they find the tomb empty. Luke writes, “While they were perplexed by this, behold, two men stood by them in dazzling apparel”. Luke means angels and the presence of two men invoke the "two witnesses" theme of the Old Testament in Deuteronomy 19:15 “A matter must be established by the testimony of 2–3 witnesses.” God was making sure that all things were done according to his plan and there would be no room for skepticism. God, the great cosmic director, has orchestrated what took place here. From the arrest, through the death, to the resurrection, Jesus walked in God's will. The women need not have wasted their money on the spices to preserve Jesus' body; God had taken care of it and had been in control all along. The angels' words bring Jesus' words back to mind. The women cannot keep to themselves what has just happened—they return to tell the eleven and those with them. What an incredible story, right? The question before us this morning is this: Do you believe that the resurrection of Jesus Christ from the dead really happened? Paul wanted them to focus on their new life as followers of Christ so that his priorities became theirs. They were now to live as those whose desires and actions were in line with their new identity as citizens of God’s kingdom, those who had died to the things of this world and were now alive in Christ and no longer addicted to the lies and temptations of this world. Paul was not simply being a moralist but was reminding them that there should be a change in their behavior because they had a change in understanding of who they had become in Christ. If who they now were was rightly understood, then obedience would be a response to, rather than a means of gaining God’s favor. This is the same thing that happened in the lives or the disciples. Once they encountered the resurrected Jesus everything changed, and their hope was restored and their mission became clear. No distortion this time, just grateful obedience. If you are a Christ follower this morning, then today is a reminder and an exhortation that the fact that Jesus lives should change how we live too. We should be living in such a way that a skeptical world sees that we have been changed. My mother used to always say, “Actions speak louder than words.” Let us pray that God will move in us in such a way that we reveal the power of the living and resurrected Christ to those around us. You may be here this morning doubting the truth of the resurrection or possibly believing that it is a myth and that there is no credible basis to claim that it is true. If that is you, then perhaps you have already checked out and are thinking about lunch or what you're going to do once you leave. Basically, you’re hoping I will soon wrap this up. If that’s you then please pay attention for just another moment. The Scriptures and sound historical scholarship even from sources outside of Christianity verify what happened to each of the disciples. • Simon, AKA Peter: Simon-Peter, who was appointed by Jesus the leader was eventually martyred in Rome during the reign of the emperor Nero. It is claimed that Peter asked to be crucified upside down, so that his death would not be the equal of Jesus and the Romans supposedly obliged. • Andrew: According to 15th Century religious historian Dorman Newman, Andrew—the brother of Peter was scourged, and then tied rather than nailed to a cross, so that he would suffer for a longer time before dying. Andrew lived for two days, during which he preached to passersby. • James (son of Zebedee, AKA James the Greater): Acts 12:1–19 says that James was killed with a sword. After James was arrested and led to the place of execution, his unnamed accuser was moved by his courage. He not only repented and converted on the spot, but asked to be executed alongside James. The Roman executioners obliged, and both men were beheaded simultaneously. • John: John was the only one of the original disciples not to die a violent death, but they tried to kill him with boiling oil. When that didn’t work they sent him to a prison colony on the Isle of Patmos where he died of old age around 100 AD. • Matthew: According to legend, the former tax collector turned missionary was martyred in Ethiopia, where he was supposedly stabbed in the back by a swordsman sent by King Hertacus after he criticized the king’s morals. Does it make any sense to you that anyone would live the rest of their lives in self-imposed poverty and danger and then to die for something that they knew wasn’t true? I submit to you that the reason that they did so was because they had encountered Jesus Christ risen from the dead and that changed everything. For over 2,000 years men and women who have come into a relationship with Jesus Christ have been willing to live and die for their belief and it is still happening today around the world. Do you want to know him too? I invite you to give your life to Jesus this morning, so that you can personally know the risen Savior and find life is worth living. I would like to speak with you about this today.